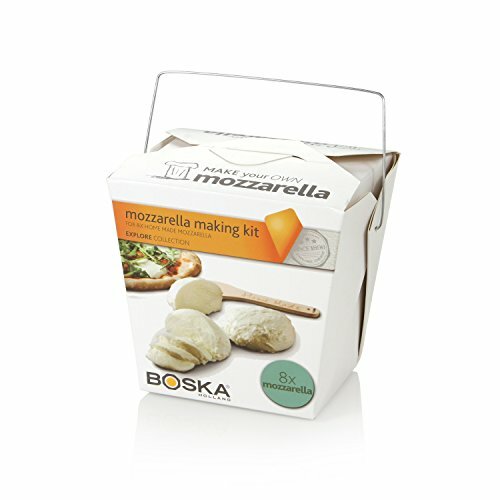 Boska Holland Mozzarella Cheese Making Kit, Homemade Set, Makes up to 8 Batches, Explore Collection by Boska Holland at The Primavera Blog. MPN: 320311. Hurry! Limited time offer. Offer valid only while supplies last. Mozzarella Making KitWhat could be more delicious on a hot summer day than a fresh caprese salad with mozzarella you made yourself and ripe tomatoes? View More In Food Preparation Equipment - Page 9. Mozzarella Making KitWhat could be more delicious on a hot summer day than a fresh caprese salad with mozzarella you made yourself and ripe tomatoes? With this easy kit, you’re halfway there. This is a great activity to do together with kids, which lets you learn about the cheese making process in a simple and fun way. It also puts you in full control of the ingredients. No unnecessary additives! It doesn’t get any fresher than this.- DIY: Make your own delicious fresh cheese, enough ingredients for 8 times- FRESH: Fresh cheese without additives or preservatives- QUICK & EASY: Ready in 45 minutes- FUN: Convenient and light packaging - great gift and fun for kidsYou’re in control!This kit has all the tools you need to make the cheese, accompanied by a simple step-by-step guide. You only need to buy fresh milk and then you’re ready to go.Contents-Wooden spoon- Thermometer- Cheese cloth- 2 rennet tablets- 30 g (1.06 oz.) citric acid- 50 g (1.76 oz.) salt- RecipeAbout Boska Holland Cheese waresWe love cheese! Since 1896, here at Boska, it’s been our mission to spread the love of cheese to everyone everywhere. Our innovative family-owned company started as a blacksmith making tools for the cheese farmers in Holland, and now we are the world’s only specialist in Cheese wares: cheese tools and accessories. In short: we sell everything you need to enjoy cheese except the cheese itself!